Description	 MS in Latin on bronze, Spain or South Italy, 209, 1 partial plaque, 22x15 cm, single column, (22x15 cm remaining), 13 lines in a transitional script between square and rustic Latin capitals. Context	 Such charitable foundations are quite well known from Italy in the 2nd c., but there is only one hitherto known from Spain, from Sevilla. The donor may be a known official who come from Venafro in south central Italy. If so, the tablet comes from Venafro. Provenance	 1. Private collector, Spain (until 1994); 2. Bernard Quaritch Ltd., London. 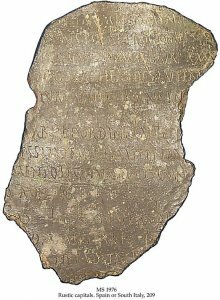 Commentary	 The surviving bronze law tablets are central to the study of Roman law. Although most of the texts consist of very small fragments, they nonetheless constitute the single most important source modern scholars have for the rules, procedures, and application of Roman law before the codifications of the late Empire. Published	 R.S.O. Tomlin: An early third-century alimentary foundation: Zeitschrift für Papyrologie und Epigraphik, 129(2000):, pp. 287-292. Exhibited	 Comité International de Palaéographie Latin (CIPL) at Senate House, University of London , 3 September 2008.